A previously unrecognized group of air pollutants could have effects remarkably similar to harmful substances found in tobacco smoke, Louisiana scientists are reporting in a study scheduled for presentation today at the 236th National Meeting of the American Chemical Society. Inhaling those pollutants exposes the average person up to 300 times more free radicals daily than from smoking one cigarette, they added. The discovery could help explain the long-standing medical mystery of why non-smokers develop tobacco-related diseases like lung cancer, said H. Barry Dellinger, Ph.D., the Patrick F. Taylor Chair of Environmental Chemistry at Louisiana State University in Baton Rouge. "Free radicals from tobacco smoke have long been suspected of having extremely harmful effects on the body," Dellinger said. "Based on our work, we now know that free radicals similar to those in cigarettes are also found in airborne fine particles and potentially can cause many of the same life-threatening conditions. This is a staggering, but not unbelievable result, when one considers all of diseases in the world that cannot currently be attributed to a specific origin." 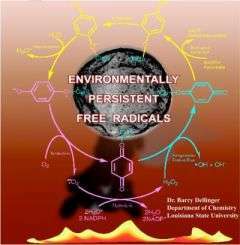 Scientists have long known that free radicals exist in the atmosphere. These atoms, molecules, and fragments of molecules are highly reactive and damage cells in the body. Free radicals form during the burning of fuels or in photochemical processes like those that form ozone. Most of these previously identified atmospheric free radicals form as gases, exist for less than one second, and disappear. In contrast, the newly detected molecules — which Dellinger terms persistent free radicals (PFRs) — form on airborne nanoparticles and other fine particle residues as gases cool in smokestacks, automotive exhaust pipes and household chimneys. Particles that contain metals, such as copper and iron, are the most likely to persist, he said. Unlike other atmospheric free radicals, PFRs can linger in the air and travel great distances. "You basically have to be in certain places to inhale transient gas-phase radicals," Dellinger said. "You'd have to be right next to a road when a car passes, for example. Whereas we found that persistent radicals can last indefinitely on airborne fine particles. So you're never going to get away from them." Once PFRs are inhaled, Dellinger suspects they are absorbed into the lungs and other tissues where they contribute to DNA and other cellular damage. Epidemiological studies suggest that more than 500,000 Americans die each year from cardiopulmonary disease linked to breathing fine particle air pollution, he says. About 10 to 15 percent of lung cancers are diagnosed in nonsmokers, according to the American Cancer Society. However, Dellinger stresses additional research is necessary before scientists can definitely link airborne PFRs to these diseases. Smokers likely get a double dose of PFRs every time they light up, Dellinger said, since tobacco smoke also contains these molecules. In the five minutes it takes a typical smoker to finish a cigarette, he or she will breathe in an equal number of PFRs from the air and the smoke itself, likely compounding the damaging effects. do shampoo's, conditioners, body scubs, face wash, cleaning supplies release free radicals into the air??? whenever a roommate takes a shower i can smell the cleaning products in the air and it makes me wonder what ingredients the products contain.